$igmund tells me him and the boys are simply doing their thing and having fun at it. They say their music is young and fresh and they are excited to add their laid-back sound to the Icelandic hip-hop scene. The album shoots off with an introduction to my lifestyle and myself and rounds up the theme and atmosphere of the album. 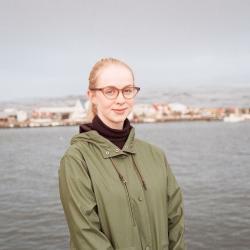 I talk about how my crew and I live and pay homage to my roots and my neighbourhood, Reykjavík 101. On this track I go deeper into the emotional side of the album. “Glópagull” deals with the disappointment of a relationship that didn’t work out. The disappointment of realizing that what you thought was gold was actually fool’s gold. This track tells the story behind all the other songs on the album. You win some you lose some but in the end, it all ends well. “120 um Hálsinn” focuses on the uncontrollable need to pull stunts and flex what you’ve got. When you put in all of the hard work, you have to stunt. The track’s beat is fun and playful and that’s basically what I tried to interpret in the lyrics as well, having fun and playing around. To form this upbeat banger the extremely talented producer Logi Pedro joined us. In “Ertu Til” I impersonate the prophet, spreading the message of putting in work to reach certain goals and spending money on lavish living. It’s a sort of a sermon. I preach to the listener to join me in my way of living. “EKTA” is about going all out. It’s about those nights going out with friends and celebrating success, drinking fancy and spending a lot of cash. To have a crazy time and lose yourself in the moment. It’s the peak of the $igmund lifestyle. “Eftirmálar” is the final song on the album and our good friend Katrín Helga collaborated with us on this track. In the lyrics I reflect on the things that follow with success. I talk about the aftermath of lost love while still doing my thing and enjoying the finer things in life the best way I can. I wanted to end the album on a personal level.